"Delaine's deadpan delivery is spot-on for the subtle humor." “Beauty Killer” Gretchen Lowell is one sick puppy. Heavily sedated and restrained in Oregon State Hospital, Gretchen sends for her old victim/lover, Archie Sheridan, to convince him to protect a girl she claims is her daughter. Christina Delaine’s performance shows a remarkable range of voices, from Archie’s scratchiness (the result of being tortured by Gretchen years before) to Gretchen’s drugged, sluggish attempts at manipulation to frightened little boy Patrick’s late-night phone calls to each of Archie’s task-force colleagues. Delaine’s intensity is sure to raise goose bumps, and it’ll take a strong stomach to listen to Gretchen’s satisfaction as she retells the nauseating details of her kills. In this fifth Archie/Gretchen matchup, Chelsea Cain’s writing is sharp as a scalpel, and Delaine wields it with deadly accuracy. ...Winner of AudioFile Earphones Award"
"In the 5th Archie Sheridan thriller, our hero throws himself into a new case, only to discover that serial killer Gretchen Lowell has the only lead. Delaine, who narrated the 4th in this series, is a great match." "Do you devour it all at once, or limit your listening to make it last longer? Either way, this story unfolds with delicate perfection. Justine Meade has lost her beloved Sheltie, Mack, to a trucker who leaves her in a roadside rest area. Mack finds a home with Ed and Alice Parmalee, who are still stunned by the death of their daughter. Christina Delaine gives us all of Justine’s love and longing—for Mack and for her other lost connections. In alternate chapters, Fred Berman details Mack’s journey, and that of the Parmalees. Both narrators portray grief and hope, despair and great love with professionalism and sensitivity. They reach that elusive “audio grail,” staying entirely out of the way of the story. Wilson’s perfect ending is a delicious dessert after a satisfying meal.... Winner of AudioFile Earphones Award." "This combination crime and horror story, set in New Orleans six years after Hurricane Katrina, is a fascinating whodunit. Plot twists keep the listener guessing until it becomes easier to simply sit back and let narrator Christina Delaine explain them all. It's a testament to Delaine's narration skill that she keeps the story moving. There are lots of characters, and she imbues each one with a vocal personality. Mira Gallier, a stained-glass artist whose husband was killed in Katrina, strives mightily to keep it together as friends and family are murdered. The police are little help—they think Mira is the killer. Double crosses, even triple crosses, keep the story lively." 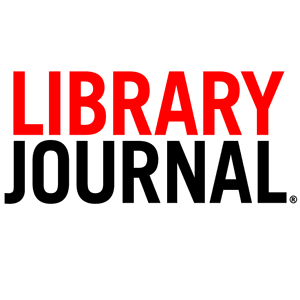 WATCH ME DIE is named one of the best audiobooks of the summer. "In the audiobook edition of WATCH ME DIE, narrator Christina Delaine brings out all the bone-chilling goodness with her reading." 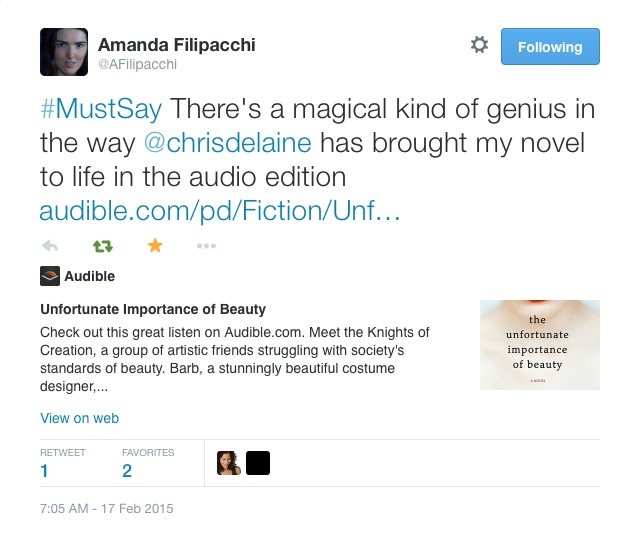 "...Spindler’s fans will keep this audiobook—excellently read by Christina Delaine—in high demand." 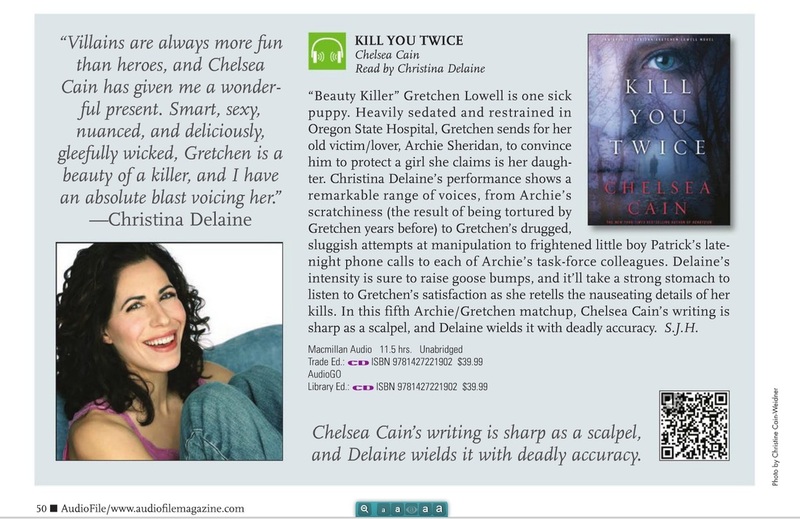 "...Putting Archie's homicidal paramour Gretchen Lowell behind bars has allowed Cain to reinvigorate the series, which includes bringing the likable Susan to the fore.This not only makes for a snappier story, it takes advantage of Christina Delaine's inspired interpretation of the ditsy, self-effacing, surprisingly professional reporter and intuitive sleuth. Her sotto voce, monotone Archie is on the money, too. He sounds as if he's still a long way from recovering from the mental and physical damage caused by Lowell. Near the book's end, Susan is locked in the killer's basement with a dead policeman, up to her waist in river water stocked with the deadly mollusks. Author and narrator combine to make it a memorably chilling moment in one of the series' better entries." "In the fourth in a series of mysteries set in Portland, Oregon, Christina Delaine’s expert portrayal of the lead female character is spot-on. Listeners can easily visualize the raspberry lipstick, orange hair, and rainbow boots of local newspaper reporter Susan Ward. Delaine also does a credible job with the lead male character, Archie, a detective who is running the task force charged with apprehending the killer. He has been badly injured, and Delaine rises to the challenge of giving voice to his damaged throat and developing pneumonia. Some of the lesser characters are a bit hard to sort out, but the overall tension, humor, and pathos remain strong. " "A suspenseful story of buried secrets and the tales that long-dead men can tell, The Night Season comes alive from Christina Delaine's stellar narrative performance. Highly recommended for anyone who enjoys listening to a good, spine-chilling mystery." "Delaine admirably reflects the rising waters and an octopus-carrying killer in Cain's newest."